Last night we went to the London launch of Bryan Talbot's wonderful Alice in Sunderland. We've been watching Bryan work with the book from the early scripts, and it's wonderful to see it finally in the flesh. The publishers have done an excellent job, and it really is a fine example of book as artefact, as well as book as story. And story is what it is, Bryan walking us through the history of a place and the history of a story, at the same time telling us the story of story, of the comic, of the cartoon. Switching from style to style, from long form to short form, this truly is one of the best graphic novels I've read (if "novel" is the right word for this melange of truth and fiction). I'll admit to a slight bias - Bryan is an old friend, and marypcb and I are credited in Alice for our work as part of Bryan's team of volunteer reference photographers, who, at the drop of a mad hatter's hat, spent hours in graveyards and on the decks of sailing ships. 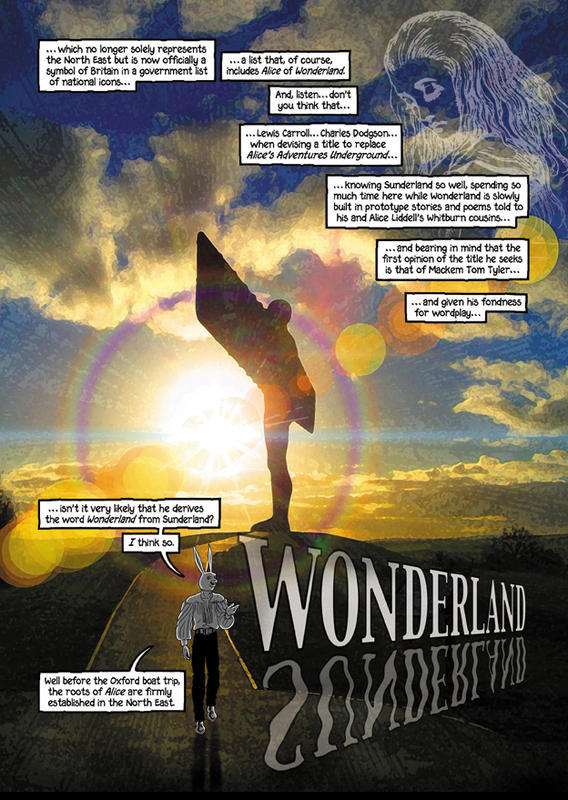 I'm also pleased to be finally allowed to show the world page 306 of Alice, where Bryan has used one of my photographs of the Angel of the North as the backdrop to a rather beautifully composed page. It was a pretty good party too - we got to see many folk we haven't seen for ages, including rozk and Neil Gaiman, and enjoyed pizza with an interesting and eclectic crowd of people. As marypcb said, "That's a normal evening with Bryan..."
Can't/couldn't get to Bryan's Coventry signing... but a friend of ours will hopefully make it (with instructions to get us a copy). Oh, that's very cool. Since the Sunderland launch was so woefully short of copies of the book, I'm planning to buy mine when Bryan does his Durham signing - so yours is a page I haven't seen yet.